Imagine sprinting up 25 flights of stairs and, once at the top, trying to thread a needle five times in a row without once missing the hole. Imagine doing that over and over while competing against a dozen other people, and you have begun to experience the sport of biathlon. 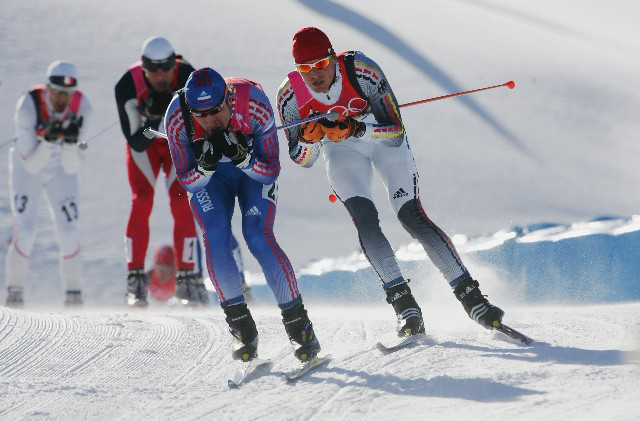 In all biathlon events, athletes have to combine cross-country skiing with small bore rifle shooting from both a standing and prone position. The athletes ski loops of the course, stopping each time to fire a prerequisite number of shots at the target. Participants incur a penalty for missing a target in all events and the athlete with the fastest time wins. Alpine skiing involves all skiing events which occur on a downhill course and do not involve ramps or awkward bumps. The Olympic alpine competition consists of ten events: five for women and five for men. The rules are the same for all but the courses differ. Alpine racing is about as basic as it can get: a beat the clock format in which a skier goes down the mountain from Point A to Point B and the fastest time wins. There is no judging involved and races are timed in hundredths of a second. The Olympic-style discipline involves racing over undulating terrain along a series of prepared tracks. Skiers set off at intervals and race against the clock rather than against each other, with the exception of the pursuit-style races. Freestyle is the ballet of the Olympic skiing disciplines. With booming music and huge crowds all there to see the spectacular performances of the men and women who love to display their jumps and aerial twists. Moguls is currently the bigger of the two events, where competitors race each other down a slope specially constructed slope with a multitude of bumps. Points are awarded for technique, speed and the quality of the two jumps required. Aerial freestyle appeared at the 1994 Games in Lillehammer and soon became a crowd pleaser. More akin to gymnastics, competitors go one at a time and perform two jumps. All three Nordic combined events consist of a ski jumping competition and a cross-country skiing race. For the individual Gundersen event, ski jumping takes place on the normal hill (90 metres). For the team and the sprint events, ski jumping takes place on the large hill (120m). The cross-country portion of the individual Gundersen event has a 15km race, the sprint event has a 7.5km race, and the team event has a 4x5km relay. Each nation can enter up to four competitors, who do not need to be the same in the individual and team competitions. There is no Nordic combined event for women. If freestyle is the ballet of the slopes then snowboarding is the theatre. The event with total street credibility. The snow version of the urban skateboarding events. The competitors are the surfers of the slopes who just love to perform as much as anything and they have huge followings among the extreme sports communities. There are six snowboard events on the program of the Olympic Winter Games: men’s halfpipe, parallel giant slalom and snowboard cross and ladies’ halfpipe, parallel giant slalom and snowboard cross. An incredibly technical and graceful discipline, in which competitors seem to defy gravity as they hang in the air over the hill. Amazing skill is required to fly 80 meters through the air and land perfectly with only your skis and arms to balance yourself. Jumping competitions are decided by a combination of points for distance and style. Points for distance are determined by the length reached in relation to the jump’s critical (K) point. Five judges award each jumper up to 20 points for style. Each competitor jumps twice, with the gold medal going to the jumper with the greatest aggregate points.